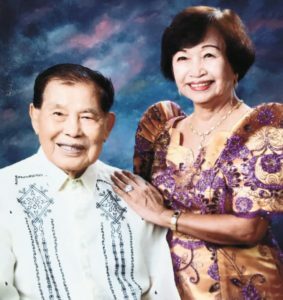 The Baggao Family celebrated Silvestre’s 90th birthday. Josephine & Silvestre are seated in front, while Jackie Hernandez, Myrna Breen and Elmer Baggao stand behind them. Young ladies in the plantation camps in the 1940s and 1950s were very rare. 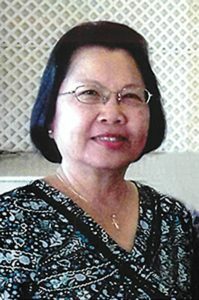 However, in 1957, there was a very attractive young lady by the name of Josephine Dumayas who arrived on Maui from Tamurong, Kawayan, Ilocos Sur, Philippines. She was petitioned by her father, a 1927 Sakada, by the name of Mariano Dumayas. In fact, Mariano went back to the Philippines in 1935 and decided to stay there for good but in 1946, he changed his mind and decided to sign up again to come to Hawai‘i as one of the 6,000 plus Sakadas who were recruited to come to Hawai‘i to work in the pineapple and sugar plantations. There was also a very handsome and charming young man by the name of Silvestre Baggao who came as a 1946 Sakada. He was born in Santa, Ilocos Sur, Philippines on July 5, 1927. 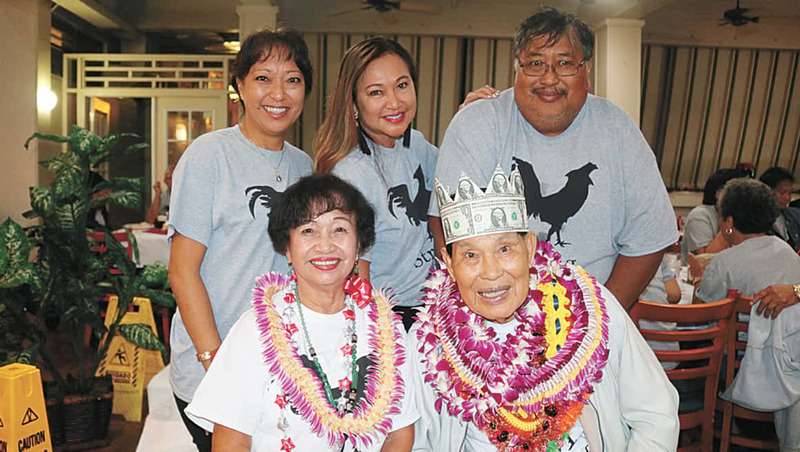 He signed up to be a Sakada to find a better life in Hawai‘i for life in the Philippines after World War II was very difficult. He worked for HC&S. Mariano Dumayas and Silvestre Baggao became best friends while working together at HC&S. When Josephine arrived on Maui, Silvestre and Mariano went to pick her up at the airport. It was love at first sight for Silvestre when he saw the beautiful Josephine. He couldn’t keep his eyes away from her. On the other hand, Josephine claimed that she was not at all struck by Silvestre because she left a boyfriend back in the Philippines. In fact she told Silvestre about the boyfriend she left behind. She also honestly claimed that she was very disappointed of what she saw here on Maui. Her expectation of Hawai‘i as Paradise was not quite what she pictured in her mind. She became very lonely and wanted to go back home to the Philippines. The Baggaos are blessed with three children: Elmer the eldest is married to Lea Soberano. He graduated from the Honolulu Electronic Institute. He has his own business called See Lights, a sound engineering and stage lighting, and E. Studio Recording for CD’s. Their second child is Myrna Breen, married to David Breen. She graduated from University of Hawai‘i Maui College with a degree in Hotel Management. She helps manage her husband’s business, Breen Builder, LLC. Myrna was a 1978 Miss Barrio Fiesta queen, Mrs. Maui Filipina Centennial Queen in 2006, and a Gold Medal Winner ABA/INBA Grand Master’s 50-59 Natural Olympia Fitness Competition. They have two children, Kimi and Daniel. The Baggao’s third child is Jackie, married to Alan Hernandez. She graduated from the International Air Academy in Vancouver, Washington with a degree in Airline Operations. She also attended University of Hawai‘i Maui College. She is employed at Ross in Las Vegas. They have four children, Hauoli, Maluike, Pariss, and Kylie. Josephine worked and retired from the Royal Lahaina Hotel in the housekeeping department. It was always her dream to go traveling someday especially Paris, France. That dream came true to Josephine and Silvestre. They have taken several cruises to Europe, The Mediterranean, and Alaska. They even traveled with the late Mayor Hannibal Tavares, Governor George Ariyoshi and Consul General Trinidad Alconcel to the Philippines. Besides traveling, Josephine and Silvestre enjoyed ballroom dancing and Filipino Folk Dancing. They even participated in routine numbers with other ballroom dancers in Las Vegas, Honolulu, and here on Maui. They were very active in the Filipino Community. 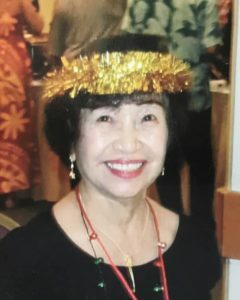 They were members and officers of the KFCA (Kahului Filipino Community Association), FCC (Filipino Catholic Club), and the USDIR (United Sons and Daughters of Ilocano Regions), and the Wailuku Senior and ILWU Wailuku Pensioners Club. Josephine is also a member of the Christ The King Women Dance Group and in the Hospitality Ministry. Josephine is petite in stature but she is the liveliest of all the lively women I know. At present, she is the sole care giver to Silvestre, her husband of 60 years who needs 24/7 care meaning he needs constant care. Even though she is a very busy woman, she always manages to make herself presentable at all times. Josephine and Silvestre are truly living up to their nuptial promises that they made sixty years ago: To love and to cherish each other, for richer or poorer, in sickness and in health, for as long as they both shall live. Their marriage is truly an epitome of a successful marriage.